Geoscience Research Institute | Teeming Creatures of the Sea! 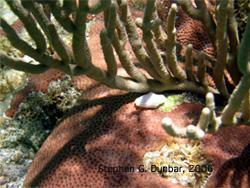 The small, white shell is a dead giveaway for the snail, Cyphoma gibossum on Caribbean coral reefs. The actual flesh of the animal is cream-colored with bright yellow spots. It feeds on polyps of gorgonian sea fans (a type of coral). However, if we consider the potential number of undiscovered species in marine systems, it’s likely that our oceans would come out on top as the environment with the greatest number of species on the planet. 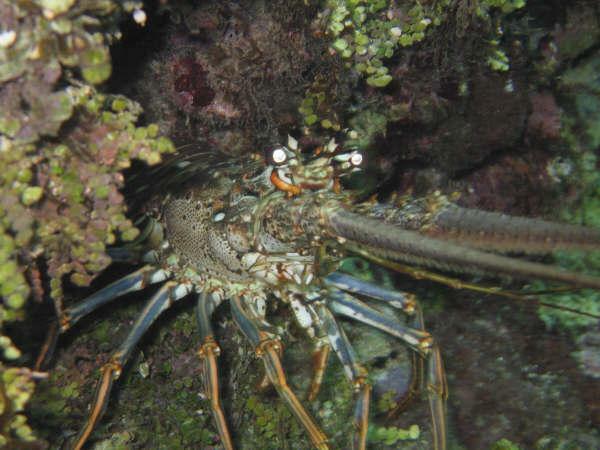 The ornately colored Caribbean Spiny Lobster, Panulirus argus, is found in crevices during the day throughout the Caribbean, and comes out to hunt and feed at night. It’s numbers are decreasing because of overfishing. and hammerhead sharks, reliant on these important nutrients, there’s always lots of competition for places to live in coral reefs. But, there’s cooperation, too! 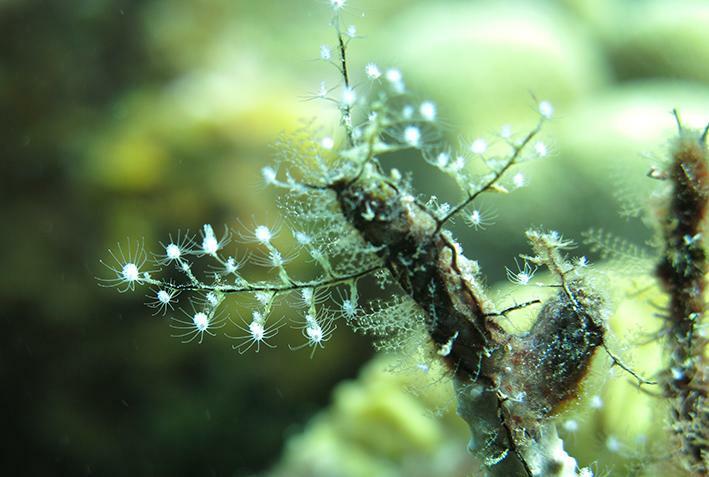 Among other things, both competition and cooperation provide us with spectacular views of so many species of organisms (that high biodiversity) in these coral reef oases. 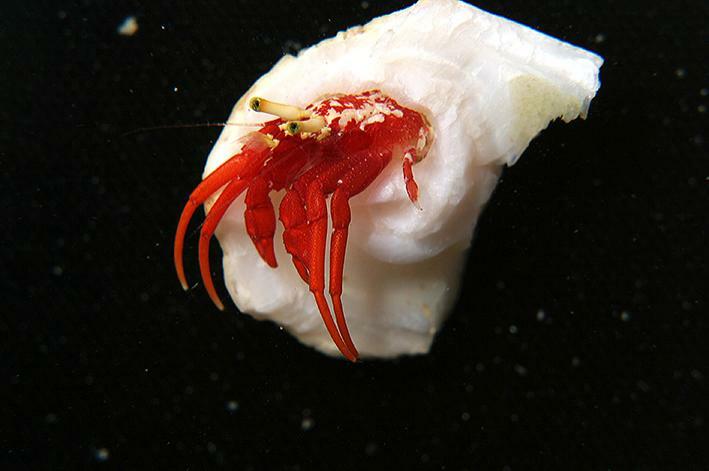 Although brightly colored, the hermit crab, Paguristes cadenati, is sometimes difficult to find because of its small size and shy demeanor. It uses the left over shell of a snail to hid in and protect its soft abdomen. reefs, as well. For example, there are about 11,000 known species of corals (which are animals, not plants) and their relatives (the jellyfishes and anemones) in existence today[iv]. One of the largest known groups of ocean organisms is the Molluscs (the snails, sea slugs, chitons, and octopuses) of which there are some 100,000 described species (although not all of these live in the ocean), along with another 70,000 that are now only known from the fossil record[v]. There are several groups of marine animals that are made up of large numbers of species. One of these is the Superclass Crustacea, with a whopping 42,000 living species[vi], including the crabs, lobsters, shrimp, and the barnacles[vii]. 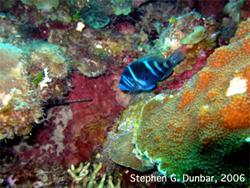 The Indigo Hamlet, Hypoplectrus indigo, is rare in many parts of the Caribbean sea, and is one of the many brightly colored fish that make up the rainbow of colors on tropical coral reefs. With so many species living in our oceans (and many more which have yet to be discovered)[viii], we can see that our oceans are places of amazing diversity, beauty, and discovery. However, humans are taking a toll on these ocean systems with our input of chemical and plastic pollution. There are some places in our oceans where plastic fragments now make up a large amount of materials zooplankton and small fish are eating every day[ix]. Plastic pollution in our oceans and washing up on our beaches has become so wide-spread, it now accounts for the death of many marine animals and oceanic birds, even in places where no humans live[x]. [ii] Castro, P. & Huber, M.E. 2010. Marine Biology, 8th Ed. McGraw-Hill New York, NY. [iv] Pechenik, J. A. 2015. Biology of the Invertebrates, 7th Ed. McGraw-Hill New York, NY. [vii] Yes! Barnacles are closely related to crabs and shrimp, even though they were once thought to be more closely related to snails, and were classified as molluscs up to 150 years ago.